I was lucky to attend the most important day of the American History, the Independence Day or commonly known as The Fourth of July. It celebrates the independence from Great Britain. And it is also an opportunity to meet up with the family or party with friends. 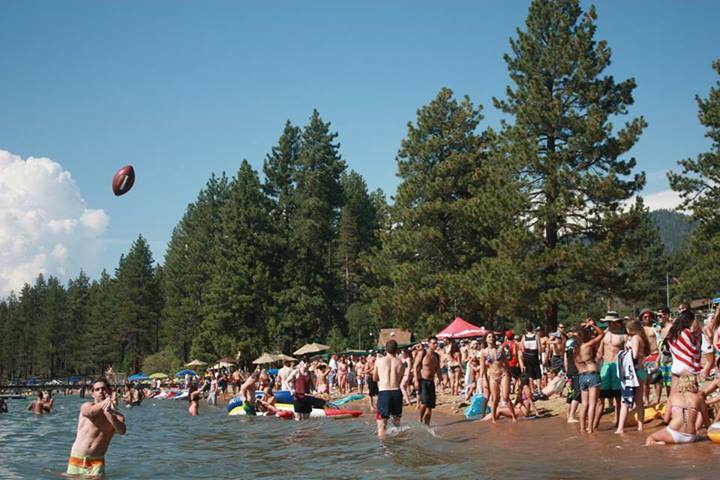 I was in Tahoe, a very crowded Tahoe, and I realized that everyone was involved in their own way. You could find little American flags everywhere on the camp site. Youth wore clothes or swimsuits with American flags or with the colors of the flag, while in France nobody is wearing clothes with French flag on the Bastille Day on the July 14th. Single people were standing on the beach partying or playing football. Families were on another beach having a great time with children, playing in the water and doing barbecues. Some parades were organized. At the end of the evening everyone was waiting impatiently for the fireworks. During the fireworks they were all excited, they screamed “America!” After the fireworks, families came back to the camp site and grilled marshmallows. As for marketing, this event is also a big deal for sales. Store owners add lots of American merchandise before and during the July 4th. It allows retailers capture more business whether it is for decorations, parades, clothes or anything in relating to this big holiday. This is a marketing opportunity setting up advertisements on the street, on the radio, or on the television, and they use social media such as Facebook or Twitter in order to reach more customers. It is also a good business opportunity for real estate and hotels. Everyone takes advantage of this holiday, retailers and consumers. During this holiday, the brand of the US is very prominently displayed. Many Americans dress with imagery derived from the flag (brand), the colors, stripes, or stars. They want to show their pride of the country, of the American history. Furthermore they are very passionate about their freedom and the flag reminds people of that ideal. So that’s why this day is very important to US citizens and why they want to celebrate. In contrast, in France July 14th is a big national holiday to commemorate the Bastille Day (Fête Nationale in French). The storming of the Bastille in Paris on 14 July 1789 was the intervention of the people of Paris during the French Revolution in order to end the attempts of King Louis XVI to regain absolute power he had lost the month before. So during this day in Paris you can assist to the military parade on the Champs-Élysées avenue opens with the École polytechnique, and aircraft of the Patrouille de France giving a beautiful show. The President is also present. One of the most attended, overall in the other cities is the fireworks at night. During this day families or friends meet up for the day or the night to go to restaurant or a bar before the fireworks. I have never seen anyone wearing colors of the French flag during this day, people don’t show their passion for the country. I know that lots of French are proud of France but we are not accustomed to express it in the same manner as Americans. But we are excited to have another opportunity to go out with friends or families and seeing fireworks and for those who can be in Paris, to see the beautiful parade and fireworks near the Eiffel Tower. I enjoyed myself tremendously and felt lucky to be witness to this important celebration during my stay in California. It is definitely a different experience than in France.